Harmony Itinerary | Visit Butler County Pennsylvania! Harmony is the site of western Pennsylvania’s first National Historic Landmark District, including more than 50 buildings and retaining the architectural character of an old Germany village. Harmony was founded in 1804 by the Harmony Society of German Lutheran Separatists seeking religious freedom. Today the town is packed with charm and history – a great way to spend a day exploring. 317 German Street – Creative Harmony Arts & Books is for the lovers of books, art & handcraft, classes and historic tours. See website for hours of operation. 539 Main Street – Drop in at Bottlebrush Gallery and Center for the Arts to see one-of-a-kind art in a variety of mediums housed in a historic 1805 building. Bottlebrush often hosts creative events, workshops and concerts. 534 Main Street – Come and try Lagerhaus Bakery to share coffee, baked goods, breakfast and lunch. 218 Mercer Street – The Harmony Museum showcases the big history of this little town with exhibits on the Harmonists, George Washington, Indians and much more. The museum owns eight different properties throughout the town. 230 Mercer Street – The Harmony Inn offers German favorites with a twist in a reportedly haunted historical building. 253 Mercer Street – The Two Fraus Bakery is an all natural, from scratch bakery. No boxed or pre-mixes ever used. Specializing in breads and not your average cookies. 253A Mercer Street – Grab a cup of coffee at Wunderbar Coffee and Crepes where an Argentinian couple serves Italian coffee in a German town! 253D Mercer Street – At Darn Yarn Needles and Thread, you’ll find a nice and knotty fiber arts store with American-made, fair-trade and eco-friendly supplies. Harmony Cemetery – See if you can move the one-ton revolving gate! 120 N. Perry Highway – You’re going to love ‘olive’ the varieties of extra virgin olive oil and balsamic vinegars at The Enchanted Olive! They also carry specialty food and gifts! 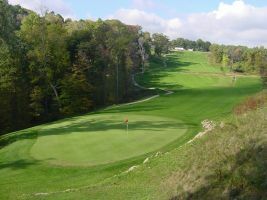 135 McNulty Lane – For a great view while you tee off your 18 holes, visit Strawberry Ridge Golf Course just off of Route 19. They also offer a driving range. 430 Perry Highway – Enjoy a view of the ‘backwoods’ from the outdoor deck while you dine in the 160 year old building that houses The Log Cabin Inn. 508A Perry Highway – If you need a unique gift, enjoy geology or want to take a class to learn something new, The Appalachian Rock Shop is the place. 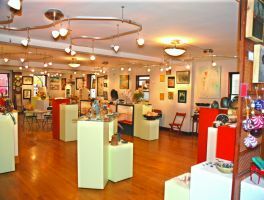 Jewelry, fossils, geodes and other one-of-a-kind items fill the shop.